Manage your Rigs and receive Repack Reminders by email. Never miss an inspection and repack again. Access your log from every browser in the world. No need to carry anything around - minimise weight on skydiving trips. Never lose your logged jumps. Your jumps are safely and securely stored in the Cloud with daily backups. 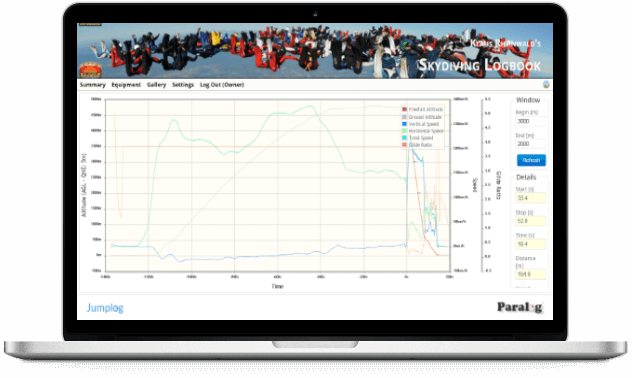 A feature rich online logbook designed by skydivers for skydivers to make detailed logging quick and easy. Upload and view tracks downloaded from a logger or GPS as a detailed chart or in 3D. Have your jumps digitally signed on the spot or through email. Accepted by major Skydiving Associations. Detailed statistics for your whole log: Jump Numbers, Types, DZs, Aircraft, etc. Upload, view and manage images and videos attached to your jumps. Share your logbook, jumps, charts and statistics by email and through social media. Fully integrated with Paralog® and Paralog® Mobile for seamless synchronization. We offer three indivdual packages to suit your needs. Each plan runs for a year and does not extend automatically - no hidden costs. The Basic account is perfect for you if you have just started skydiving and and are new to digital logging. Your log will be public. The Professional Account holds unlimited jumps for the expert user and includes automatic jump creation from Flysight, GPX and ProTrack II tracks. When your subscription expires, editing, uploading and syncing of your log will be disabled. Your log will still be accessible for 12 months and full access can be reactivated during that time.